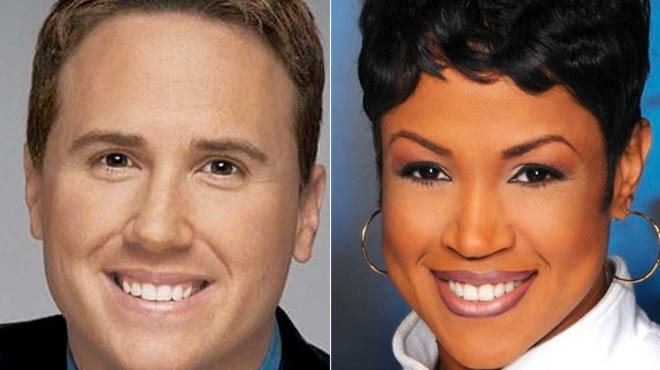 The hottest Chicago talent search in years has come down to two winners: Ryan Chiaverini (above left), the weekend sports anchor at WLS-Channel 7, and Valerie Warner (above right), the early morning news anchor and traffic reporter at WGN-Channel 9. Sources said Chiaverini and Warner have been chosen to host the live, local morning show expected to air at 9am weekdays in place of The Oprah Winfrey Show on ABC 7. After 25 years in syndication, Oprah is ceasing production of her Chicago-based talk show in May. Officials of the ABC-owned station could not be reached for comment late Wednesday, but insiders said an announcement could come as soon as Thursday that Chiaverini and Warner had landed the coveted roles. They emerged from a field of more than 500 applicants nationwide and an audition process that tested more than two dozen hopefuls in various combinations on camera. Executive producer Marlaine Selip and supervising producer Cindy Patrasso, who are developing the show under the working title of Morning Rush, are expected to produce it each day in front of a studio audience at ABC 7 headquarters at 190 N. State. It’s the same place Oprah began as host of the local A.M. Chicago on January 2, 1984. Chiaverini, a native of Corona, Calif., and a graduate of the University of Colorado at Boulder, joined ABC 7 as a sports reporter in 2006 from KUSA-TV in Denver. He was promoted to weekend sports anchor in 2009. Warner, who also grew up in southern California, graduated from the University of California at San Diego. She joined Tribune Co.-owned WGN in 2005 from WEYI-TV in Flint, Mich. Last July she was named anchor of WGN’s expanded morning newscast at 4:30am while continuing as morning traffic reporter. Ryan Chiaverini replaces Oprah??? Is it April Fools Day already? I’m not trying to be mean, but Ryan bugs me because he talks out of the side of his mouth – literally – what’s up with that?! Speechless. Except to say now i know why Ryan’s been tryin out those new hairpieces with the horrifrying highlights. Almost as scary as Valerie’s make-up and jewelry every morning. This show’s gonna tank faster and harder than ‘Monsters & Money in the Morning’. Emily Barr, u had a nice run. Pound for pound, the team of Ryan (above left) and Valerie (above right) don’t even come close to an Oprah Winfrey. Is Val leaving WGN? Bad move if so. BTW- Lester Holt talks out of one side of his mouth and Jenna Wolfe (TODAY SHOW weekend) talks out of the other side of her mouth. Was that planned? Following up on Clutch’s comments, don’t want to appear as mean – but WHAT ARE THEY THINKING? Ryan & Valerie? Are you kidding me? That’s the best available? I just google’d the producers and see that when they last got together in Chicago, their national show with Bill Rancic and Kim Coles and some woman I’ve never heard of was a complete and utter train wreck and cancelled within 8 months. You don’t need Carnac the Magnificent to tell you that history’s about to repeat itself. For the sake of all the jobs involved behind the camera, I truly hope this works out. This won’t last long.6 months,and they will both be looking for a new job. I agree with Clutch…I cannot watch the guy talk out the side of his mouth. This show is going to be nothing more than another hour of the morning news. They must have the same dentist, their teeth are identical. I love Val. I hope this works out for her! I think everybody is making way too much of this. Ryan and Val are not “replacing” Oprah. We’re talking about a brand NEW show, and a LOCAL one. I think the fact that producers chose a pair of news vets who have been around Chicago for a few years speaks volumes. Both have good personalities and are down to earth…and who cares if the show comes across as somewhat “newsy”. The show will be going up against a third hour of the Today Show, and the local news show that Fox32 is running. Would you rather have some comedian or actor try to force laughs and try to sell the fact that they’re “Chicago” even though they’ve been living in LA? I’d rather watch some real people. I’ll give it a chance. Hey Ryan, what’s next? ABC World News Tonight?! I was delighted to hear about Val Warner. I wish her the best of luck with her new show and will be her number one fan! But will miss her on channel 9 with the best crew in the morning! 1. They could bring back the Morning Movie with Ione & her exercising. 2. Bob Kennedy could return as host. Yes, I know he died a long time ago, but Madame Tussaud’s could make a wax dummy, old tapes will provide his voice & they’d still get higher ratings. 3. Hire Regis. He currently works for ABC & will soon be available. 4. Melissa Forman, if only to make Katie happy! I’m Katie’s night nurse at the Lakeshore Hospital. She was very upset by this news and had to be sedated. She wanted me to tell the readers of this blogg or whatever you call it that she thinks neither of the people who got the job have a nice enough tan. I’m not sure what that means, but she kept on saying it over and over. There were hosts before Oprah came to AM Chicago. Rob Weller and Sandi Freeman. People should be celebrating that Chicago will have another local show produced here and tailored for Chicagoans. WTF people…. Channel 7 could have gone the lazy route and replaced it with a syndicated Maury clone. The 6-month predictions on here I donít think are for the showÖbut for the HOSTS! Ryan is one of the nicest guys I’ve ever met. Okay, grant it, I think I’ve talked to him only once (at Bears Family Day at Soldier Field a couple of years ago), but he was real nice. Doesn’t Ryan look like Chastity Bono’s skinnier sister? Ryan’s one of my favorite local news personalities, so I’m thrilled for him. He seems really cool and down-to-earth. I’m not a regular watcher of WGN News, but the few times I’ve seen it, Valerie came across well, too. I wish both of them the best. Congratulations Valerie, got deserve it! Keep the Faith. Oprah wasnt OPRAH when she started! Wow, welcome to the “Sour Hour.” Folks love to trash and tear down. They act as if they don’t have programming options. Give the show a chance. Both hosts are talented and we wish them well. For me, YouTube rocks the house. Countless videos at your fingertips: James Moody (RIP), Coltrane, Louie Vega, Frankie Knuckles, Bad Boy Bill, assorted video tutorials–YouTube is where I’m putting my money. I prefer to run my own railroad stocked with prime curated content. Ha! I like all the “local show” comments here. So while many of our stations are hiring “local” folks who know the city to come back and work, this show does a 180 and brings in two west-coasters for this show who’ve been here a combined ten years. Not sure what to think of that. The Show I would tune in to see is… The Rob and Warner Morning Heat! Are you kidding me? Even though they are NOT replacing the “almighty” Oprah, these 2 are LIGHT WEIGHTS! Come on! Especially to pick ANYBODY from that joke of a morning show at channel 9, was Emily’s 1st mistake and then came Ryan! Oy, this will end almost as soon as it begins, nothing special to offer! UGH! Will tank faster than the Titanic. To #20: WLS did go the lazy route. How hard it to hire a couple of nitwits and then do story after story on the best pizza place in Chicago or which is better North Side or Sout Side? This is not innovative at all, it is the same as always. As mentioned elsewhere this show has nothing to with replacing Oprah. It has to do with filling the 9am-10am hour on local TV station and the cheapest way to do that is what is beibg done at WLS. Get a grip wiseass!! I really wish people would get the idea that Ryan and Val are not replacing Oprah. Skeptics are dooming them to fail. It’s not the new Oprah show. @ 18, LMAO!! Hope Katie’s feeling better. I wish the new show and everyone involved luck. A new show live, in and about Chicago is a good thing. I think it’s great there will be a daily local Chicago show on the air again. Plus, Ryan and Valerie are likable personalities. It definitely won’t match the ratings of “Oprah”, but it should do decently well. Hopefully, they won’t turn it into an “Hour Magazine” clone… Gary Collins had about as much personality as a box of fiber cereal. Can we get Steve Cochran to take Valerie’s place on the WGN morning news? Well this is good news for fans of the WGN AM News..Val will be gone…she can’t ad lib. Up in the chopper Val over a fire, “There’s a fire, let’s watch” great Val, thanks for all the good info. I would’ve preferred Allison Payne & Serene Branson. Just remember that Oprah wasn’t Oprah when she started. There are some really good reasons why she pulled the plug on Oxygen rerunning her old shows, and it’s not just because of the dated clothes and hairstyles. Congratulations to them both. I didn’t think Val could pull off a show by herself (other than 4:30 am news) but I’m no professional. I wish them both the best. I really like Val in the mornings and I wasn’t really an Oprah watcher anyway. Good luck Val and Ryan! Maybe they will move Nancy Loo inside? I never thought she fit in very well on the WGN morning show anyway. I wont miss her taste in clothing and jewlery…She wore something the other day that looked like a quilt, or maybe some pieced together curtains. I love Valerie, she is great on GN in the morning, it will let her personality be on display, however if ryan doesn’t work out, bring in Pat Tomassulo from GN. He and Val have a good rapport ! I am so glad all the pundits here on this blog know so much more than the professionals that are running this new show. How about giving mancow another chance at tv? And the Roe Conn dream flames out and cart wheels into Lake Michigan. O come on! I know some pros who ran WCKG into the ground – and WGN / WNUA / Webio / Mike North Show / Monsters & Money in the Morning / etc. – what’s your point?! @23 Stephanie – Yes! If their new show has anything to do with “news” or gossip (or anything else really; it’s just a lousy idea), it’ll be more vapid noise adding to the cognitive wasteland that is American media. OMG – Someone actually thought this would fail because of what Valerie’s clothes and jewelry look like? This is about as shallow as we can go! Oprah was an overweight, not very elegant beginner when she started her show…..and look where she is now! I have a lot more faith than the majority of you here! Fresh talent is a good thing. This will be a great show! Ryan has trouble chatting on the set on the weekend ABC7 news. Val has trouble chatting on the set of the morning WGN news. Maybe they will learn to chat to each other as therapy. Or they can just sit there and look at each other. Sad the number of negative comments. I have never watched Ryan, but I wish him well. I have watched Val on WGN since her arrival and enjoyed her. Good Luck and God Bless them both. To all the negative nellies, in the words of Cee-Lo Green ‘Forget U’. Congratulations Val….I will miss waking up with you…you made my day with your clothing style and smile. You’re no Oprah, but I am happy, extremely pleased with Val!!!! Congratulations to both especially Val. Some of you are very mean spirited and hating on Val already. Oprah was not a star when she first began and I still cannot stand her. I have to agree–I think both are going above their talent level. Val was eating during one of her traffic segments earlier this week. So unprofessional. Also, she’s shopped in the store where I work and is rude outside of work let alone when interviewing on the show. But can’t wait to see Erin and others step up who are much better at their jobs! Congrats neighbor Val. I am proud of you! I just heard this morning. You have our support! Love Sharon. Wow, like Val as traffic and fun stuff but real news and discussion she leaves much to be desired. Then again, look at Deborah Norville, dope in Chicago(dope not in a good way) and then the east coast calls and well; guess you don’t have to have talent. Ryan Chiaverini, vanilla is as vanilla does. Boring is the key on the network scale. I think these are great choices. Valerie is funny and seems to be very comfortable in front of the cameras. Can’t wait to see this show. I am going to miss her on WGN. I watch it every morning. I have little opinion about the presumed new hosts-to-be but I DO have an opinion about the posting by #23 – startlingly accurate observation!!! Can’t help but LMAO!!! Val. Warner & Ryan, & Oprah can do stuff like this.! Executive producer Marlaine Selip and supervising producer Cindy Patrasso are brilliant people. I have met neither or them, but I have a point believe it or not. That entire team over at Channel 7 is on top for a reason. They have been there for years! Do you think they think like the Cubs? No, they think like the Yankees and they win, win, win. I met Emily Barr a few years ago at a golf outing. Spoke with her for 5 minutes and learned more in 5 minutes than I learned at IBM in 30 years. I have been working at a small station as a weekend warrior for 20 years and everyone knows that Ch. 7 is THE standard. There are many of us little guys out there who work part time in the industry. We recognize the Major Leaugers and it is over at 190 N. State. Ryan and Val will be fine. Why can’t we just congratulate them without all the negativity. They are not replacing Oprah, just something new for that time slot. Do frama when Bob Barker was changed …I’m just saying. Little late on this — missed Val on WGN — for her sake and all those who have jobs tied into this — I truly hope this works. I’ll watch for a while and see. I would have been much happier if WGN not only gave up their traffic reporter but also their sports commentator. One talks about lack of chemistry, he has no chemistry. It would have been a pair that would have lasted perhaps a month! I think Val could do it all by herself! She’s fantasic, beautiful, personable, likeable, energetic, and full of fire! I’m not sure what Ryan could bring to the plate but I guess we’ll have to wait and see. I do hope it works out for them. Please people leave Val alone!! Carol Bonner what channel are you on? Obviously Val impressed who she needed to in order to get the job!! when you know darn well it was Opie! I mean dopie.. you know…BUSH!!! GIRL GO FOR IT! We look forward to seeing your greatness, don’t mind the jerks.